UKPSC, Haridwar has released Result of Uttarakhand AE Exam 2013 after interview that was conducted on 13 to 23 July. 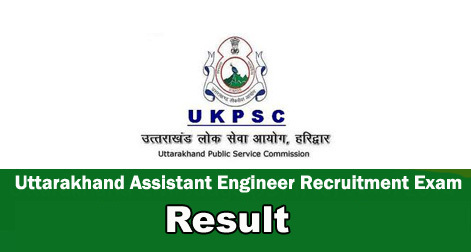 UKPSC has declare the result for the exam of Assistant Engineers held on 6, 7 and 8 June 2015. Answer keys of Uttarakhand AE Exam 2013 for Genral Hindi, General English, General Studies, Civil Engineering, Agriculture Engineering, Electrical Engineering & Mechanical Engineering of all four series – A,B,C and D was published on July. Now Candidates can check their result of Uttarakhand Combined Engineering Service Examination. Check out the final result of Assistant Engineer Exam 2013 in Uttarakhand. The interview process had been conducted on 13 July to 22 July 2016. Help us to improve this article/job posting "Uttarakhand Assistant Engineer (AE) Exam 2013 Result". We would be glad if you can comment below and provide your valuable suggestions and feedback. If this page have any wrong information/list or out of context content, then you can report us as well.